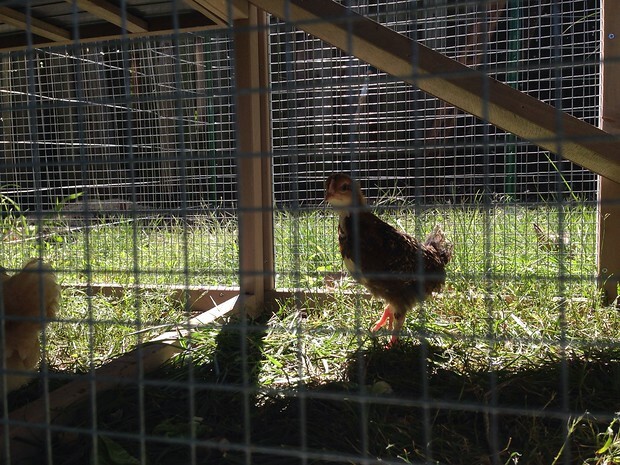 Baby chickens…more things I’m responsible for keeping alive. 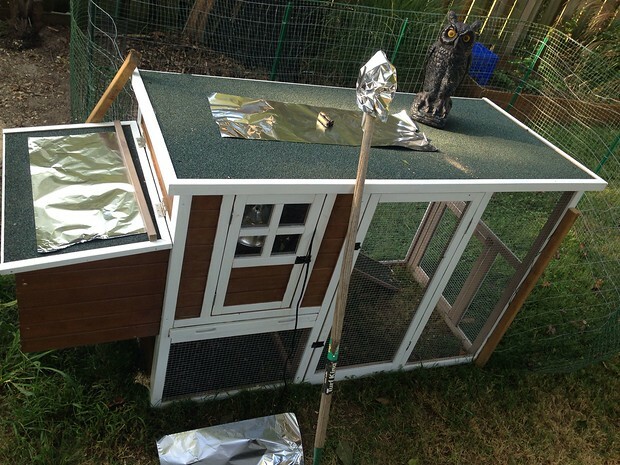 A month ago, after an evening with Helen and John in Effingham, and a few drinks, we decided we should get some chickens. 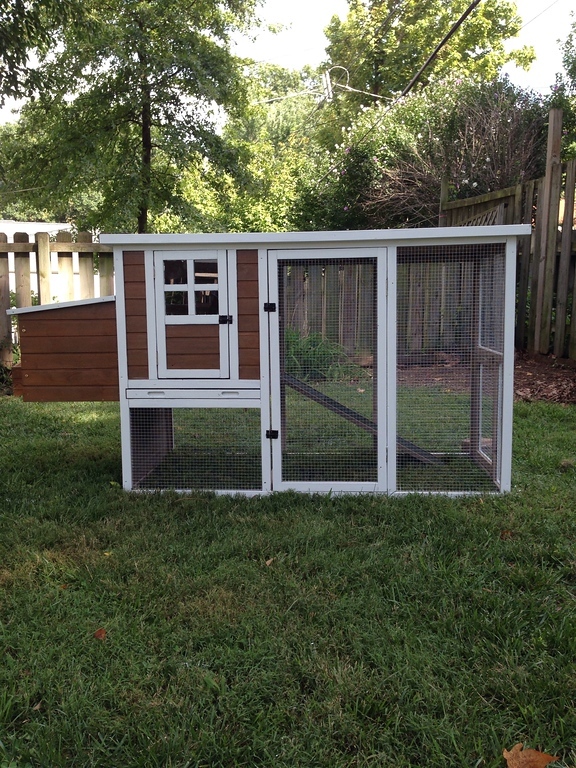 Twelve hours later Helen and I bought a darling little chicken coop at Rural King. This is how it looks put together, and with two coats of stain and paint to make it pretty. 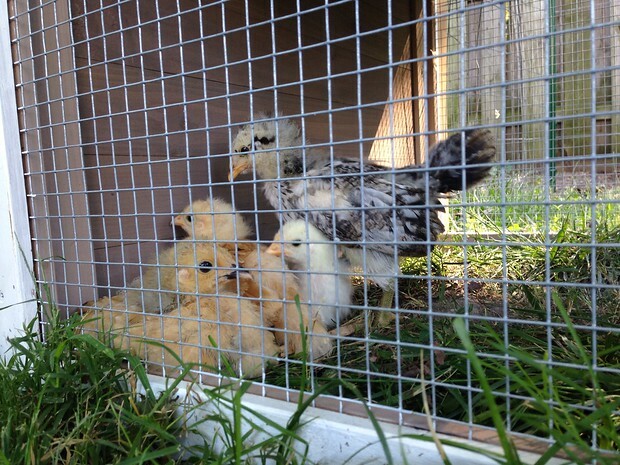 The next weekend we bought four week old chicks: Clementine, Harriet, Penelope, and Josephine. They lived happily in our laundry room for two weeks before we decided, with constant heat from the heat lamp, they could move into their coop outside. So last weekend we moved them out and they loved the extra freedom and room, along with time to find crickets in the grass and take dirt baths. On a side note, one of our lovely chicks does seem to be getting bigger and more aggressive than the others, could she be a he? 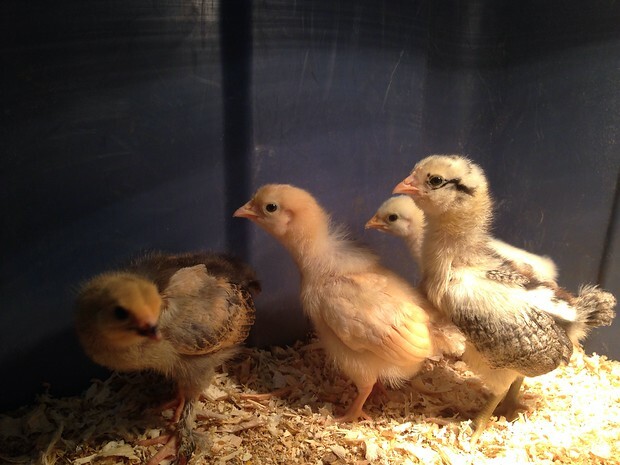 Just in case, when I bought more feed for them this week I also bought another chick. Here is Florence, our Speckled Sussex. Needless to say, he came back, 6 more times yesterday and was here this morning. 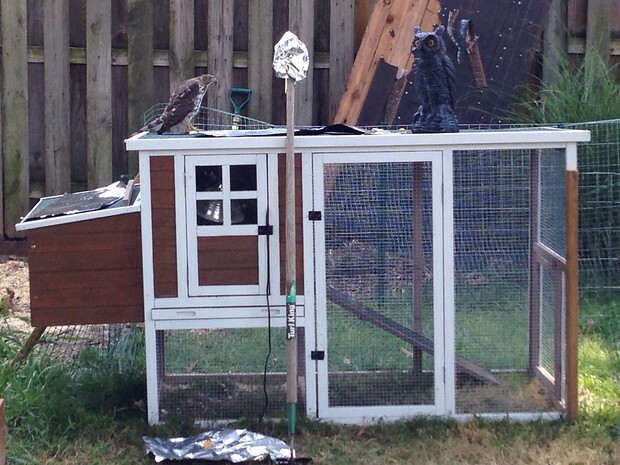 Since Maggie and I were going to be picking apples with Will’s class this morning, I took matters into my own hands using a neighbor’s fake owl and some aluminum foil. 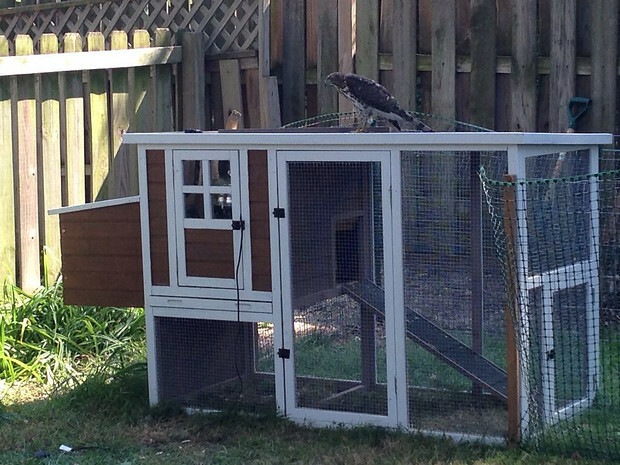 I’m the first to call myself “a crazy chicken lady”. 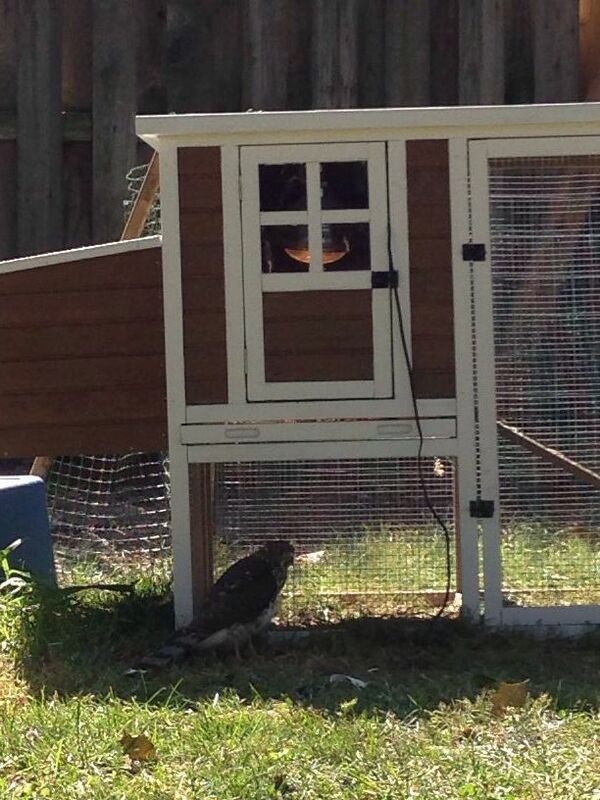 The hawk was on our fence when we returned from the orchard, not on the coop, but there are claw marks in my foil to show he attempted to land there again. Wish me luck! Apparently the hawk and owl go way back. They’re friends.